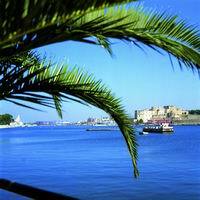 Land of Light, Land of History: Brindisi, in Italy of course. "A diversified land, where light acts as a protagonist and as an amalgam. It illuminates the precious facades of churches and old palaces with ochreous flashes, plays among the "trulli" stones and the little dry-walls, steals into the white lanes of the historical centres, suddenly sups through the olive-groves, excites the blue reflection of the sea, giving everything a particular brightness that is the truest distinctive mark of this part of Apulia. From Brindisi, the chief town, to the white cities of the hills of Murge, to the ancient ones, built in the shadow of the castle, a territorial entity is defined through a great wealth of emergencies, regarding landscape, history, art, folklore, handcraft and traditions. A sunny land, rich in nature, a coast of remarkable beauty, the right destination for the lovers of the sea or for the people who want to go through unpublished routes to discover caves, castles, cathedrals, rocky settlements, trulli and ancient farms. Brindisi, the gate of East Very old town, crucible of civilisations and theatre of events, rightly considered by history, Brindisi grew on the most Oriental port of Italy, that decided its fortune, determined its destiny and in a certain way, raised its city image. The terminal columns of Via Appia, being reflected in the waters of the inside port, from the top of their steps, watch over Virgilio's so called last residence and tell all visitors the glorious story of regina viarum (Queen of streets) and the numerous events that made Brindisi famous in the world: here Caesar and Pompeius engaged in their epic sea-fight, here Antonio and Octavianus divided the Roman Empire. After the fall of the Roman power, Brindisi continued to identify itself with the history of its port that, among ups and downs, reached a new popularity at the period of the Crusades, when it became the crossroad for the knights and the pilgrims, directed to the Sepulchre. In the XIX century, again thanks to its strategic position, Brindisi determined the fertile experience of the "Valigia delle Indie" (merchandise from India), that changed the town in a rich commercial emporium, linking up London and Bomaby. Fragments of history, whose remains are still found in the city road system, following the interesting routes we suggest, to know the original system of fortification of the ancient Brindisi, to admire the dignified refinement of its buildings, the imposing residences of Knights Templars, the magnificence of its churches, and at last, to discover the authentic essence of the town, called by Federico Il "filia solis" (sun's daughter) for the particular Mediterranean light of this extraordinary outpost towards the East. The last spurs of the eastern "Murge" characterize the part of the land placed at the boundaries of the provinces of Bari and Taranto. The landscape assumes a fantastic tone: from the rocky cliffs, the thick forest of the olive trees goes slowly towards the sea, while over the highest hills stand out the compact white villages. 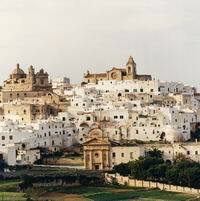 These are the white and blue towns: Fassano, Cisternino, Ostuni, Carovigno, Ceglie Messapica, Villa Castelli and San Michele, a galaxy of historic centres where everything is improbably clean and everywhere there is a blinding sun, a light without shades and without half tones. Ancient towns, made of light and white, wedged and extraordinary unicum that is the "Murgia" of the "trulli" fancifully characterized by a tangle of inextricable narrow streets bristling, winding, going up and down and by a crowding of white houses and by a following of small arches and overpasses. Between the green country and the blue sea there is Ostuni, the bright town with the white slaked limes. Above the building circle of walls, the historic centre develops over the side of the hill, at the top of which there is the soaring tympanum of the cathedral. From the houses, hidden in a singular whiteness, thousands of small windows look over the splendid panorama and, at the horizon, the intense colours of the sea go beyond the limits of the limpid blue of the sky. In the distance the cave "Grotta della Maternità" watches over the city and tells about a land inhabited since the prehistory. Near there, Carovigno presses round its castle, keeping almost untoched the original feudal structure. The frame around the ancient Carbinia, is a fertile country, rich of olive trees and characterized by an extraordinary beautiful coast of great environmental value. Ceglie Messapica gathers over the top of its hill, where the ancient "messapica" acropolis rose, appearing to the visitor with a surprising scenery. The powerful massive structure of the castle stands out over the white houses of the people and in the silen squares, in the narrow streets animated by coloured talkers spread the stimulating smells of gastronomy with irresistible attractions. 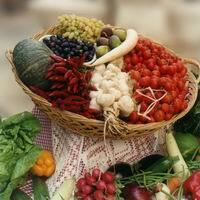 Villa Castelli, more isolated, is a breath of serenity in the luxury of the agrarian landscape. The quiet small town has its proud in the beautiful ducal palace, that today has been transformed in a confortable town-residence, and its identity element in the "gravina" (canyon) that crosses and divides the built-up area, giving out into the air the smells of the mediterranean underbrush that there grows in its various essences. In this area, as in the rest of the land of Brindisi, noble handcraft-activities offer exclusive manufactures for creativity, materials and abilities: through and interlacement only guided by hands take shape the different kinds of baskets, wonderful products of an ancient art; beds, gates, lanterns are the wonderful objects of the artisanship of the wrought iron, and then, the charm of the ancien embroideries and the masterpieces of the patient art of the stonecutter. Where the last cliffs of the "Murgia" degrade, the sweet and sunny plain of Brindisi extends, as a part of the larger "salentino" Tableland of which it announces colours and atmospheres. A stretch of red earth over which the green of the cultivated lands expresses itself in various shades and that has as background the sea; in fact a few kilometres farther on the colours have a new chromatism, the land smells acquire salty notes that announce the Adriatic blue, always lifefriend of a substantially peasant-people. A calm landscape with few shades and essential contrasts: earth, tree, stone. Long rows of dry walls mark the luxuriant country and direct to ancient towns where the vistor will reveal the less known part of Apulia, bu intact in its identity. Town burnt by the sunbeams where various evidences of a remote past that goes from the prehistory until now are brought to a new life. Archeological sites in the country or hidden under the medieval built-up areas tell the history of the "Messapi", the Romans, the Greeks settled in these quarters; castles, baronial palaces, towers and bastions remind of the conquests of the Normans, the Suevians, the Angevins or to the dominations of noble local stocks and link with the plot that has marked the history of Mesagne, Francavilla Fontana, Oria, Latiano, San Pietro Vernotico, San Vito dei Normanni, Cellino San Marco, San Pancrazio Salentino, Erchie, Sandonaci, Torre Santa Susanna and Torchiarolo. Cathedrals, sanctuaries, small rural churches look after real art treasures, testifying the faith of a people and the patronage of noble families. Suggestive underground ways reveal rocky settlements made more charming by the pictorial signs left in this area by the "basiliano" monasticism. 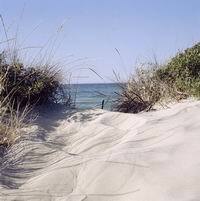 Going between the sea and the inside, the visitor will know an environment interwoven with the colours of nature where the rural background, fruit of man's labour, is added harmonically to the natural background without tearings or disorders. The shapes and colours of the country transform into the most vivid shades of the seaviews. Here a multicoloured-series of coast-beauties of great environmental importance await the visitor: a discontinued sequence of beaches, hidden small bays, enchated creeks, cernellated stretches of coast and, in the locality of Pilone-lido Morelli, between the coast of Ostuni and that of Fasano there are the suggestive gold sand dunes, covered with the mediterranean underbrush and guarded by a tower of the XVI century. In this journey through the landscape of Brindisi, an important halting place is the area of Torre Guaceto, where nature, more than elsewhere, has given its gifts. It's a place of very ancient settlement since the bronze age, that then was visited by the "Messapi", the Romans and the "Aragonesi", who, in the XVI century, built a tower to protect the coast from the pirate attacks. The land of Brindisi gives to the nature lovers the chance to enjoy places of particular interests: the "Saline Regie", a system of coast basins recognized as "oasis of protection of the fauna"; the "Canale Cillarese", a potting of about 276 hectares that gives shelter to different avicultural species and where, during spring, it's possible to observe the passing of rare species such as the crane; the humid area of "Giancola" a long watercourse coasted by palustrine plants and where, hidden in the mediterranean underbrush, there are the foxes, badgers and hedgehogs' lairs. In Tuturano the wood of S. Teresa is the last tip of the most eastern european and mediterranean place of the cork oak, this wood area declared oasis of protection. In the land of Francavilla Fontana, on the boundaries with the towns of Ceglie Messapica and Villa Castelli, the woodland area "Bottari" stretches for 120 hectares at the bottom and on the sides of the narrow valley bearing the same name, showing holm oaks and English oaks of remarkable dimensions. In this journey at the discovery of nature the "Selva di Fasano" is a compulsory stop, a splendid settlement at the bottom of a valley of remarkable landscaping interest where there is a faunistic-park that stretches on 120 hectares, the"zoosafari", a suggestive corner of savannah in the land of Puglia. The archeological wealth represents one of the most important elements of historic interestof this land wholly to discover. The geographic position and the favourable climatic conditions made this part of Puglia and ideal place for the human settlement even from the most remote ancient times. Among sea, hills and ancient suburbs there is an extraordinary archeological way, a precious casket that sometimes comes out, revealing to the visitor's astonished look and to the scholar's careful interest fragments or more consistent signs, dumb and yet eloquent of a millenary history. In the land of Brindisi every town looks after an archeological site, finds scattered among the olive groves leaning to the ancient farms, hidden under the floors of the churches, squares and places that methodical exavations or, in some cases, fortuitous finding bring back to light. A long-winded documentation that in the luckiest cases concentrates on real archeological parks. In Fasano, on a coast "deeply tormented by very limpid waters" there is the archeological site of Egnatia, ancient "messapica" town and then roman "municipium" celebrated by the immortal verses of Orazio. The walls, the forum, the structures of the amphitheatre, the residences, the "basiliche", the ruins of the Traiana Way testify and tell the history of the ancient settlement that, among different events, survives until the X century. Attached to the park, thenational archeological museum contains and looks after the precious finds: sculptures, funeral equipments, coins, jewels and in particular the pottery here produced and called "gnathia". The archeological itinerary in the land of Brindisi has to stop in Ostuni where there is a fascinating page of history that goes back to about 25.000 years ago. On the hill of the white city, there is the cave of the sanctuary of S. Maria di Agnano, ancient place of worship at first pagan and then christian. A ravine of extraordinary suggestion where nature and holiness melt and where it has been discovered the burial place of a young lady on the point of giving birth to her child. Today Delia - so it was called the most ancient sweet mother of the world, can be admired in themuseum of the pre-classic civilizations of the southern "Murgia", located in an ancient monastery in the historic centre. This archeological adventure in the land of Brindisi is rich of promises for the future: in Mesagne the archeological museum "Granafei" has about 2.500 finds of the "messapica" era belonging from the towncentre and from the areas of Muro Tenente and Muro Maurizio, where excavation sites are still in progress. Always, in Mesagne, in the quarter of Malvindi, near the farm bearing the same name, there are the finds of a thermal plant of Roman age. In Villa Castelli the excavation sites of Pietra Pertosa testify the presence of a vital neolitic settlement until the end of the XVII century: awaiting the end of the excavation sites the most significant finds are exhibited at the entrance of the ducal palace. The "Messapi", this people that look part in the history of the land of Brindisi, showed its presence in Valesio, in the territory of Torchiarolo, where, despite the abuses of time and vandals, are still visible their traces in the Messapican town bearing the same name, which later became roman with the name of Baletium. Other particularly important signs of the "messapica" presence are found also in Oria and Ceglie Messapica. Fortified circles of walls, inscriptions, graves attest the age of a land by archeological findings that can be seen here and there; another interesting surprise in a land that doesn't love to show its treasures but prefers to give back to the visitor the ancient taste of discovery. Protector of the historic memory of the province is thearcheological provincial museum "F.Ribezzo"
in Brindisi, where five interesting ways are suggested: the epigraohic and statuary section; the antiquarian section; the prehistoric section; the numismatical section and the section dedicated to the sculptures, that may be dated between the IV century a.C. and the III century d.C., found some years ago in the underwater excavation of Punta del Serrone. The archeological documentation enjoyable from the administrative centre is not only in the museum; in fact the town has in its built-up area, in addition to isolated finds of great interest suc as the end columns of the Appian Way, the site of S. Pietro degli Schiavoni: a quarter of roman era that can be visited through a suggestive way on which there is the modern town-theatre"Giuseppe Verdi, the only theatre all over the world raised over an archelogic zone. From castle to castle A journey in the historic memory of the ancient land of Brindisi allows to know the charm of an archtectonic hierarchy that has at its top a series of imposing castles. The battlements are for this land, as for the whole Apulia, the most important expression of the civil architecture, the element of continuity that persists for many centuries and dominions, characterizing the landscape and influencing remarkably the courses of settlement. Towers, bulwarks, fortresses built with a defensive aim, buildings made and rearranged when security represented a priority-necessity, but also elegant castles given the task to state and emphasize the power of the ruler of that time. In fact, the castles were often the domus appointed to a restplace, to sumptuous parties, to hunting, to the rulers'love meetings that, numerous, took place on these lands and also of their courtiers. Federico II, the "puer Apuliae" has given the sign of his charism to Brindisi in the powerful castle built on the coast of the west bay in 1227. It was Ferdinand I of Aragon to make the fortress surrounded by walls with four cylindrical large towers and then Charles V ordered further extensions. The Suevian castle is defined by the people of Brindisi as "land castle" to distinguish it from another defensive building desired by Ferdinand I of Aragon in the exterior harbour, on the place of the eremetic abbey of Saint Andrew on the island, called "fortress on the sea". 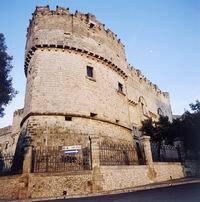 It's again the mythic Federico II who left to Oria its royal mark in the powerful castle clung to the ancient acropolis of the "Messapi", that has the particular for of an isosceles triangle and is characterized by a large quantity of weapons with barracks, storage, secret passages and tanks. At the bottom of the tower of the "Salto" there is the entrance of the ancient hypogean church of the saints Crisante and Daria. The itinerary of the castles reveals in every town and in every suburb a tower, a bastion or, at least, a toponym that recalls the presence of a fortification in that place. The history of the castle of Mesagne is strongly marked by bloody fights: the ancient castle, built by Roberto il Guiscardo in the XII century, was completely razed to the ground by Manfredi in 1256. On its ruins in the XV century De' Balzo Orsini erected the actual building that has had a lot of rearrangements before assuming the peculiarities of a splendid residential palace. On the main square of San Vito dei Normanni there is the castle commissioned by the influential Boemondo d'Altavilla in the XII century: the fortress has been rearranged different times until achieving the actual elegant architectonic forms. The most ancient nucleus of the castle built in the XV century by De' Balzo Orsini in Carovigno goes back to the Norman period; it was built to defend the town from the raids by saracens and pirates. Among the white houses of Ceglie Messapica stands out the big castle that the duke Fabrizio Sanseverino, Lord of the town, built in the XV century around two large preexistent towers. Then there was a certain pacification that dissolved the quarrelsomeness and reduced the pirate raids; in this climate of rest a lot of feudal lords transformed their small fortresses in elegant residences. Like this, in Francavilla Fontana, Michele Imperiali in 1730 transformed his castle built in the XV century by De' Balzo Orsini in the actual residence that nowadays gives hospitality to the town administration. It's always thanks to Imperiali, a powerful and prestigious family of these lands, that the ancient castles of Latiano and Villa Castelli lost the various elements of fortification, bringing out the character of family-residences. The same thing did Chjurlia in Cellino San Marco where the sixteenth century castle built by the feudal lord Antonio Albrizzi was transformed and widened and the same happened for the crenellated castle of Torre S. Susanna. 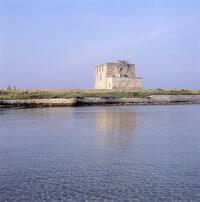 While the castles and the fortified palaces outline the feudal history of a lot of communes of Brindisi, other important signs of the history of the territory are the numerous towers on the coast, forming a system of fortification made between the XV and XVI century to defend our coasts from the pirates. The "trullo", masterpiece of peasant civilization Italian and foreign scholars have made enquiries about the origin of the "trulli" and their evolution in different times. For a lot of them the humble cone presents a certain affinity with the greek "tholos", but while this last one required a project, a professional performance, the "trullo" arises from a primary housing need and it is, originally the solitary work of a master peasant, who, unaware of the sophisticated building techniques, gives life to a spontaneous architecture where the real "modulus" is the wonderful integration with the environment. Maybe in the past the "trullo" with an unicellular chracter wasn't used as dwelling place, but as storage for agricultural implements. The the peasant, employing the plentiful stones coming on the surface, improved his building abilities and built dry "trulli", without mortar or other material, stone over stone, putting them one next the other according to the growing needs of the family. It's possible to follow the evolution of the "trullo" on the formal level: from the most archaic cone-shaped "trullo" beginning from the floor level to one being based on a cylindric wall of about two metres, to the most advanced coneshaped dome which is built on cubical base. The originality and charm of the "trullo" are contained in its capacity of keeping during the time the vitality and the use of the past; in fact it hasn't been changed in a ruin-monument, but defying the centuries, it remains the emblem of that peasant civilization that, between anxieties and sacrifices has been able to preserve untouched, the relationship man-environment. The path of faith Brindisi is a land rich of resources and opportunities including a tradition of faith and devotion typical of the religious dimension of its people. From small town to small town, from lamd to land, the patronal festivities run for the whole year in a phantasmagoric calender of lights, sounds and colours. Every community gathers around its own saint to which renders solemn celebrations: illuminations, concerts of bands, fireworks frame the long processions of faithful people who follow the blessing statue. The Christmas tree hasn't defeated here the tradition of the Natvity scene nor the choral representations of the Nativity, the living Nativity scenes set in the streets of the suburbs, in the scenery setting of the rocky settlements or in the ancient farms. The rites of the Holy Week and of Easter are present in the area of Brindisi, and in Francavilla Fontana they take on forms of high suggestion. Here the enigmatic figure of the "pappamusci", hooded and barefoot penitents, start on Maundy Thursday from church to church to visit the "sepolcri" (sepulchres), and the "pappamusci cu lli trai", bent under the weight of huge crosses, follow the procession on Good Friday, renewing the tragedy of the Passion every year and arousing the moved participation of the crowd thronged along the streets. At atmosphere of great sprirituality blows around the sanctuaries, located mostly in the peaceful tranquillity of the country, in places where the collective memory hands down miracles or prodigious facts. The Marian worship has ancient roots in the land of Brindisi and there are a lot of sanctuaries dedicated to Our Lady, built mostly after finding by chance a sacred effigy or after events considered miracles. That is exactly what happened for the sanctuary of "Madonna di Jaddico" in Brindisi; that of Cotrino in Latiano; for the sanctuary of "S. Maria della Croce" in Francavilla Fontana; that of Pozzo Faceto in Fasano; that of "Madonna di Ibernia" in Cisternino and the sanctuary of Belvedere in Carovigno. Destination of pilgrimages and solemn processions, the Marian sanctuaries are places of the spirit where the popular faith and devotion express themselves in their most authentic forms with ancient and suggestive rites. The idea of the prodigy represents the daily life of the trusting people who ask the taumaturgical intercession of the Saints Cosmas and Damian in the sanctuary of "San Cosimo alla Macchia" in the land of Oria. The big religious building developed on the site of an ancient church, today is a real citadel of faith, destination of thousands of pilgrims. What strikes the visitors is the hall of the "exvoto", where the popular faith has inerwoven a big puzzle made of signs now humble and innocent, now precious and solemn, always of great emotional impact. in the itinerary of the faith places there is also Erchie, a small centre where since the year 1000 the sacred mortal remains of Saint Lucia are hidden in a ravine. On the rim of that ravine, where water considered miraculous pours out, the popular faith in 1700 has built a church that has become destination of pilgrimage for the people, who wetting their eyes in the sacred source, ask the protection of the Saint of Syracuse. In Ostuni, the itinerary of faith is added to that of the landscape: the street that goes to the sanctuaries of S. Oronzo and S. Biagio climbs up the hill, discovering at each hairpin bend a beautiful landscape, an atmosphere that sings the praises of meditation and nature. In S. Pancrazio Salentino, the sanctuary of S. Antonio alla Macchia has been built on a small monastic church and is surrounded by a forest of pines, crowded by many devoted believers, S. Maria Crepacore in Torre S. Susanna and the small temple of S. Miserino in Sandonaci complete wonderfully this itinerary with the witness of their ancient architectonic structures. The Mediterranean at table The land of Brindisi expresses through the peculiarity of the gastronomy its real identity and its most authentic features of mediterranean place. The gastronomy of Brindisi substantially simple, is characterized by an ideal of frugality that doesn't scorn however the noblest products and the most refined elaborations. Here, every dish is a fragment of history and civilization, an identity element for those who live in these lands. The table of Brindisi connects the exciting smells of the Adriatic sea abounding in fish with the more rustic tastes of the land, showing on the table, quite specularly, the double soul of the people grown on the sea and deeply rooted to the fertile humus of its country. Giltheads, brasses, groupers, mullets, superb sea crayfish make a fine showing of themselves in the numerous fish-shops on the squares of the market, ready to throw into ecstasy the most demanding palates, but to intrigue the most greedy people is the task of the less aristocratic squids, cuttlefish, sardines, little polyps and little anchovies. Among these sea-products, the most important of all is the mixture called "ciambotto" that the clever skill of the cooks or of the simple housewives transform in the glorious soup of fish of Brindisi that competes for the supremacy with the well-known soup of Gallipoli, becoming object of a secular conflict among the connoisseurs of Salento. And what about the "fragaglie", small fish in boiling oil, once speciality of the numerous cellars of the ancient villages? And about the sea urchins whose triumphs were celebrated at Savelletri, near the ruins of Egnatia? Taste of sea also in the tasty first course: from spaghetti or "cavatelli" with seafood, to "tiella" of rise, potatoes and mussels. This last speciality is heritage of the spanish presence in Apulia, but while the Iberian "paella" modulates on a variety of ingredients and tastes, our "tiella" is sublime in the unvarying taste of the mussels, known as the black mussels, real pillar of the seafaring cookery in its countless variations: "arracanate", pickled, fried, in omelet... Coming back to the first dishes, the "orecchiette" open the long catalogue of pasta made at home: with the ragout, the turnip tops, and in the most strong version with "ricotta forte". The gastronomic knowledge expresses itself also in the preparation, strictly by hand of "sagne, lagane, strascinate, cavatelli" and in the creative gift of making superlative seasonings with the use of poor raw materials. The pasta with "muddica", crumbs of stale bread fried in oil, and "Iugranu stumpatu" are preparations of real "gastronomic archeology" that nowadays the modern catering industry rediscovers and elevates to high dignity. "Fave" and chicory are a real whim for the gourmet: the peasant-dish par excellence that the most rigorous people advise to cook in the traditional "pignata" with rain-water and strictly on the wood fire. The fertile land of Brindisi assures excellent vegetables and legumes that with the most rural tastes of the spontaneous herbs, are prepared in different ways, a real mosaic of recipes whose wedges join in the unmistakable and extraordinary taste of the olive oil. From the thick wood of the secular olive trees arises and esteemed seasoning: the extravergine oil - for whose discovery it's possible to follow the lay-out of the "olive street" capable of exalting one of the poorest dish, as the "frisella", toasted ring-shaped cake made of corn and barley, that a tomato, a drop of oil, a pinch of origanum and salt transform in the most important dish of a lot of summer-dinners with a typical mediterranean taste. A place of honour among the esteemed products of Brindisi concerns the cheese industry; the itinerary of the white food discovers "mozzarelle, scamorze, cacicavalli, burrate, stracciatelle, giuncatelle" which have a fresh and light taste and of "pecorino" which has a stronger taste. In the menu of Brindisi there are also excellent meat food whose peculiarities are found in the cooking of the taverns: the stewed horse-meat chops with "pecorino" and celery, and the roulades of tripe cooked in a spicy broth. The white alleys of the small towns of the Murgia of Brindisi at nightfall give out the irresistible sweet smell of the meat cooked on the stoves that every butcher's shop has: "gnummaredd", tender kid, tasty sausages cooked on the spit, throw into ecstasy the palates of merry groups. The confectionary of Brindisi has the smell of the country and a home-made taste and it's the almond tree, a very widespread tree in this area, that offers its caloric food to "ricci, copete, ritaglie", lamb-shaped and dove-shaped Easter cakes. The list of the sweets go on with "mostaccioli, grafioli, bocche di dama, real sins of gluttonery whose recipes are often heritage of ancient monasteries, sweets to which the votive spirit of the people of Brindisi assign, in some cases, the names borrowed from the Holy World: Saint Lucia's eyes, the Apostles' fingers. The most typical delicacies in the land of Brindisi obey to the festivity ritual: at Christmas there are the "pettole, purcedduzzi and ncartiddate" envelopped in honey or drowned in cooked-wine, that send out from house to house their sweet smells and renew the threads of memory. In an area with a strong viticultural bent and with an administrative centre that has given the name to that ancient ritual of good wishes, "il brindisi" (the toast), wine is a nectar with a stirring taste, a product of extraordinary history and qualitative value; to discover it, it's sufficient to go through the wine street, a long lay-out that displays with tastings and samplings, the best of the local oenological production.